There were 105 S&P 500 selling climaxes last week. This means that 105 of the 500 S&P stocks (21%) dropped to new 52-week lows, but bounced back to end the week with a gain. 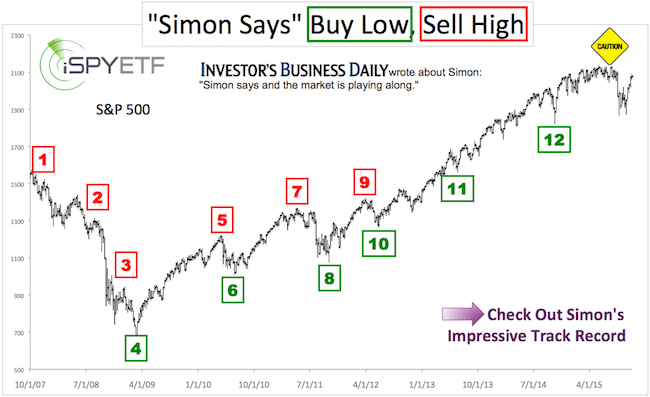 The S&P 500 Index itself also saw a selling climax. The chart below highlights all weekly reversals (not all of them led to 52-week lows) since mid-2013. All but one (August 24, 2015) were followed by at least another week of gains. The weekly bar chart also shows that the S&P 500 reached (and exceeded) the minimum down side target at 1,848.77 and the October 2014 low at 1,820.66. The January 18 Profit Radar Report proposed that a break below S&P 1,870 would lead to a swift drop to 1,820, but listed five reasons why stocks should bounce thereafter. With the minimum down side target(s) met, the odds of a bounce or more lasting low have increased. It remains to be seen whether this bounce will stick or eventually (perhaps after weeks of chopping around) roll over. A break below 1,812 would unlock the next down side targets. Such a break, if it does occur, would probably set up a better buying opportunity (assuming there will be a number of bullish divergences). Continued updates and analysis are provided via the Profit Radar Report. For the fourth time since October 2014, the S&P 500 is testing the mid-1,800s. That’s right about where investors threw in the towel before, and with regret watched the S&P move higher. Will it be the same this time around? The chart below plots the S&P 500 against the CBOE Equity put/call ratio, the percentage of bullish advisors and newsletter-writing colleagues polled by Investors Intelligence (II), and the percentage of bullish retail investors (polled by the American Association for Individual Investors – AAII). As a composite, those three groups are about as bearish as they were near prior S&P lows. 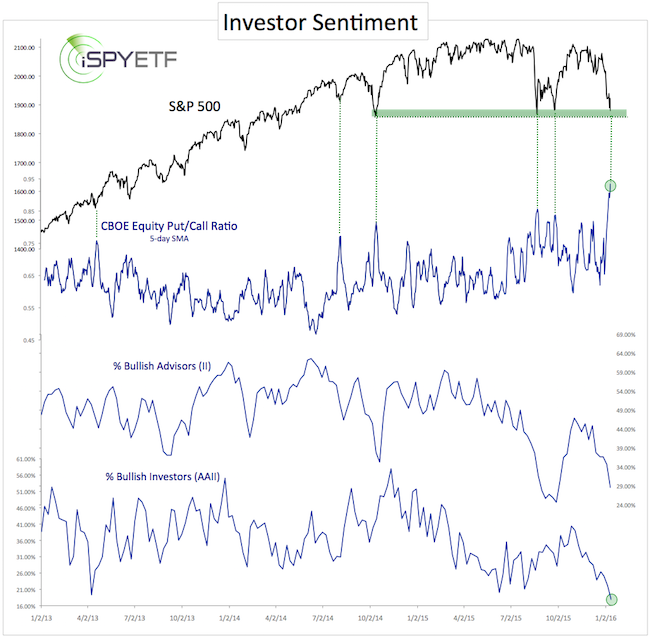 In fact, the CBOE Equity put/call ratio soared to a multi-year high on Friday, and the percentage of bullish investors is at a 10-year low. Investor sentiment suggests that stocks are ripe for a rally, but this would be the fourth time the S&P is following the same script (bounce in the 1,800s). Is it time for a curveball? 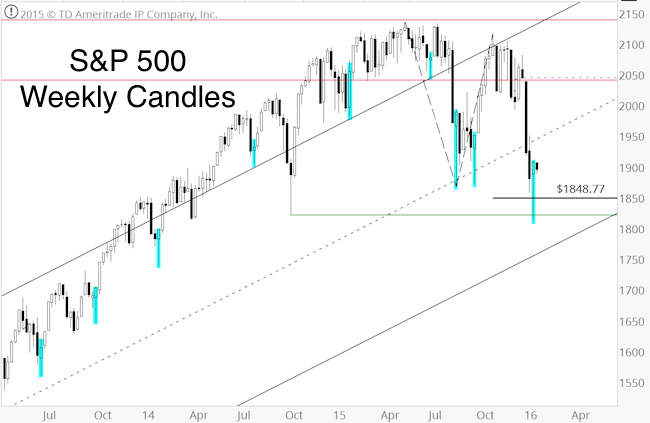 The January 19 Profit Radar Report warned that a break below support at 1,870 would result in a quick drop to 1,820 and provided a long-term perspective on the S&P 500 (has a major market top been struck or not?) along with a short-term forecast. 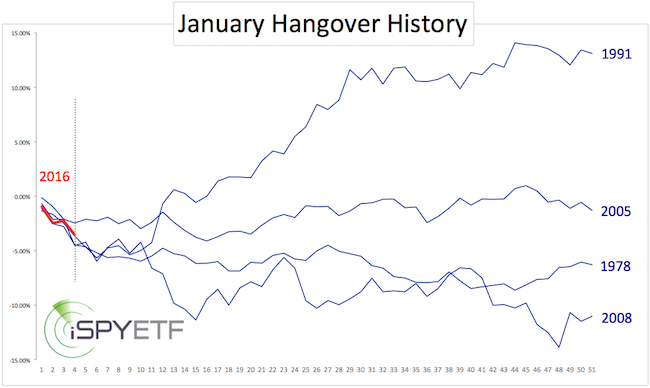 To put it mildly, U.S. stocks have been in a severe funk since December 29. How low can stocks go? We are dealing with a stock market rogue wave. By nature, rogue waves are unpredictable freak waves. Nevertheless, they occur often enough to discern certain rogue wave patterns. “The chart below plots the S&P 500 against the CBOE Equity Put/Call ratio (dark blue) and the VIX (light blue). We are not quite seeing the same panic readings as in August, but we’re reasonably close. 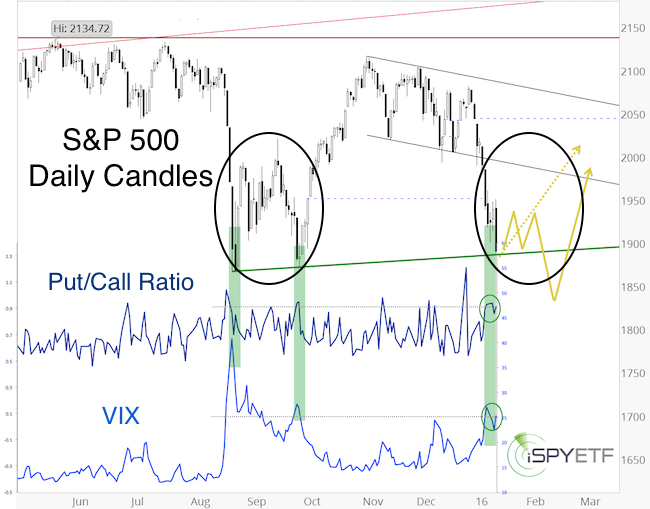 It’s worth noting that there is a small bullish divergence (green circles) between the S&P 500 (which dropped to a new low) and the VIX and p/c ratio (which did not reach new extremes). Upon completion, rogue waves tend to be followed by either 1) A snap back rally (dashed yellow projection) or 2) A choppy bounce, another low, and then a snap back rally (solid yellow projection). At this point in time, the S&P is enjoying the biggest intraday gain of the year. Now we’ll have to see if it follows the dashed or solid yellow projection more closely. For continuous updates and hand-crafted out-of-the-box research, test drive the Profit Radar Report and become the best-informed investor you know. 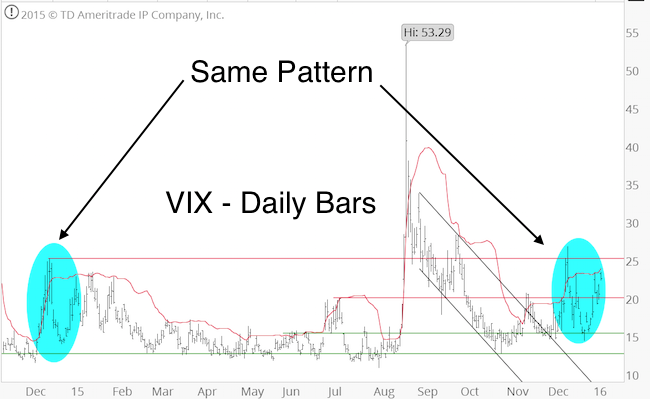 The December 13, 2015 Profit Radar Report first suggested that the VIX is following a pattern last seen in December 2014. The blue circles below highlight this correlation. 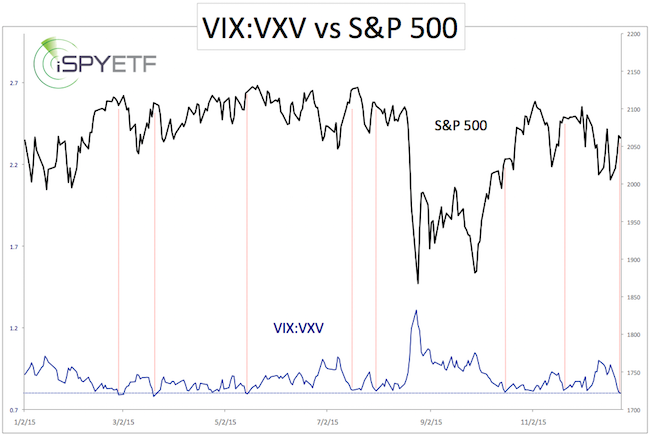 The notion of a rising VIX was confirmed by VIX seasonality and the VIX/VXV ratio. The VIX is up 48% since and is now testing the upper Bollinger Band (red line) like it did on January 7, 2015. A move to the UPP generally means the move is stretched, at least short-term. December and January are usually the strongest months for stocks, so misfires – like in 2016 – are quite rare. The S&P 500 closed down 4 of the last 5 trading days (last two days of the old year, and first three days of the New Year – Dec. 30, Dec. 31, Jan. 4, Jan. 5, Jan. 6). Since 1970, that’s only happened three other times. 1977/78, 1990/91, and 2004/05. 2008 didn’t officially make the list, but the S&P was down 3 out of 5 days, and suffered the worst percentage loss. The chart below shows how the S&P 500 fared after such poor year-end/New Year spurts. The sample size is small, but 2 out of 4 times things got worse. In 2005, the S&P stabilized, and in 1991 the S&P soared shortly thereafter. Like 2016, 2008 was an election year with a second-term President. The most plausible cause of this unusual weakness was discussed in detail here on November 2, 2015.